In 1944 in Bretton Woods, New Hampshire, representatives from 44 nations met to develop a new international monetary system that came to be known as the Bretton Woods system. Conference attendees had hoped that this new system would "ensure exchange rate stability, prevent competitive devaluations, and promote economic growth". It was not until 1958 that the Bretton Woods system became fully operational. Countries now settled their international accounts in dollars that could be converted to gold at a fixed exchange rate of $35 per ounce, which was redeemable by the U.S. government. Thus, the United States was committed to backing every dollar overseas with gold, and other currencies were pegged to the dollar. For the first years after World War II, the Bretton Woods system worked well. With the Marshall Plan, Japan and Europe were rebuilding from the war, and countries outside the US wanted dollars to spend on American goods—cars, steel, machinery, etc. Because the U.S. owned over half the world's official gold reserves—574 million ounces at the end of World War II—the system appeared secure. However, from 1950 to 1969, as Germany and Japan recovered, the US share of the world's economic output dropped significantly, from 35% to 27%. Furthermore, a negative balance of payments, growing public debt incurred by the Vietnam War, and monetary inflation by the Federal Reserve caused the dollar to become increasingly overvalued in the 1960s. In France, the Bretton Woods system was called "America's exorbitant privilege" as it resulted in an "asymmetric financial system" where non-US citizens "see themselves supporting American living standards and subsidizing American multinationals". As American economist Barry Eichengreen summarized: "It costs only a few cents for the Bureau of Engraving and Printing to produce a $100 bill, but other countries had to pony up $100 of actual goods in order to obtain one". In February 1965 President Charles de Gaulle announced his intention to exchange its U.S. dollar reserves for gold at the official exchange rate. By 1966, non-US central banks held $14 billion, while the United States had only $13.2 billion in gold reserve. Of those reserves, only $3.2 billion was able to cover foreign holdings as the rest was covering domestic holdings. By 1971, the money supply had increased by 10%. In May 1971, West Germany left the Bretton Woods system, unwilling to revalue the Deutsche Mark. In the following three months, this move strengthened its economy. Simultaneously, the dollar dropped 7.5% against the Deutsche Mark. Other nations began to demand redemption of their dollars for gold. Switzerland redeemed $50 million in July. France acquired $191 million in gold. On August 5, 1971, the United States Congress released a report recommending devaluation of the dollar, in an effort to protect the dollar against "foreign price-gougers". On August 9, 1971, as the dollar dropped in value against European currencies, Switzerland left the Bretton Woods system. The pressure began to intensify on the United States to leave Bretton Woods. At the time, the U.S. also had an unemployment rate of 6.1% (August 1971) [notes 1] and an inflation rate of 5.84% (1971). To combat these problems, President Nixon consulted Federal Reserve chairman Arthur Burns, incoming Treasury Secretary John Connally, and then Undersecretary for International Monetary Affairs and future Fed Chairman Paul Volcker. Nixon directed Treasury Secretary Connally to suspend, with certain exceptions, the convertibility of the dollar into gold or other reserve assets, ordering the gold window to be closed such that foreign governments could no longer exchange their dollars for gold. 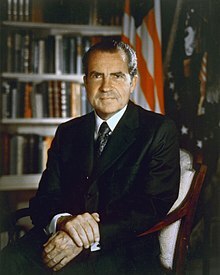 Nixon issued Executive Order 11615 (pursuant to the Economic Stabilization Act of 1970), imposing a 90-day freeze on wages and prices in order to counter inflation. This was the first time the U.S. government had enacted wage and price controls since World War II. An import surcharge of 10 percent was set to ensure that American products would not be at a disadvantage because of the expected fluctuation in exchange rates. The American public believed the government was rescuing them from price gougers and from a foreign-caused exchange crisis. Politically, Nixon's actions were a great success. The Dow rose 33 points the next day, its biggest daily gain ever at that point, and the New York Times editorial read, "We unhesitatingly applaud the boldness with which the President has moved." By December 1971, the import surcharge was dropped as part of a general revaluation of the Group of Ten (G-10) currencies, which under the Smithsonian Agreement were thereafter allowed 2.25% devaluations from the agreed exchange rate. In March 1973, the fixed exchange rate system became a floating exchange rate system. The currency exchange rates no longer were governments' principal means of administering monetary policy. The Nixon Shock has been widely considered to be a political success, but an economic mixed bag in bringing on the stagflation of the 1970s and leading to the instability of floating currencies. The dollar plunged by a third during the '70s. According to the World Trade Review's report "The Nixon Shock After Forty Years: The Import Surcharge Revisited", Douglas Irwin reports that for several months, U.S officials could not get other countries to agree to a formal revaluation of their currencies. The German mark appreciated significantly after it was allowed to float in May 1971. Further, the Nixon Shock unleashed enormous speculation against the dollar. It forced Japan's central bank to intervene significantly in the foreign exchange market to prevent the yen from increasing in value. Within two days August 16–17, 1971, Japan's central bank had to buy $1.3 billion to support the dollar and keep the yen at the old rate of 360 Yen to the dollar. Japan's foreign exchange reserves rapidly increased: $2.7 billion (30%) a week later and $4 billion the following week. Still, this large-scale intervention by Japan's central bank could not prevent the depreciation of US dollar against the yen. France also was willing to allow the dollar to depreciate against the franc, but not allow the franc to appreciate against gold (Page 14 Douglas). Even much later, in 2011, Paul Volcker expressed regret over the abandonment of Bretton Woods: "Nobody's in charge," Volcker said. "The Europeans couldn't live with the uncertainty and made their own currency and now that's in trouble." While a freely floating national money has advantages, however, it also has risks. For one thing, it can create uncertainties for international traders and investors. Over the past five years, the dollar has been worth as much as 120 yen and as little as 80. The costs of this volatility are hard to measure (partly because sophisticated financial markets allow businesses to hedge much of that risk), but they must be significant. Furthermore, a system that leaves monetary managers free to do good also leaves them free to be irresponsible—and, in some countries, they have been quick to take the opportunity. Debates over the Nixon Shock have persisted to the present day, with economists and politicians across the political spectrum trying to make sense of the Nixon Shock and its impact on monetary policy in the light of the financial crisis of 2007–2008. Michael D. Bordo. 2018. "The Imbalances of the Bretton Woods System 1965 to 1973: U.S. Inflation, The Elephant in the Room." NBER Working Paper No. 25409. Bordo, Michael D.; Eichengreen, Barry, eds. (1993). A Retrospective on the Bretton Woods System: Lessons for International Monetary Reform. Bretton Woods, Oct 3–6, 1991. Chicago: National Bureau of Economic Research & University of Chicago Press. ISBN 0226065871. ^ To compare over the period from 1950–2013 from the same Bureau of Statistics Unemployment rate data, in the United States unemployment rates rose to highs of 10.8% in November 1982 and 10% in October 2009; and dropped to lows of 2.5% in May, 1953; 3.9% in September, 2000; 4.4% in May, 2007; 5% in March 1989; 7.7% in July 1992; 7.9% in October, 1949; 7.4% in August 1958. ^ Lewis, Paul (August 15, 1976). "Nixon's Economic Policies Return to Haunt the G. O. P." The New York Times. Retrieved March 25, 2019. ^ Lowenstein, Roger (August 5, 2011). "The Nixon Shock". www.bloomberg.com. Bloomberg. Retrieved March 25, 2019. ^ Ghizoni, Sandra. "Establishment of the Bretton Woods System". US Federal Reserve. Retrieved March 17, 2014. ^ a b c d Lowenstein, Roger (August 4, 2011). "The Nixon Shock". Bloomberg BusinessWeek Magazine. Retrieved March 26, 2013. ^ "Money Matters: An IMF Exhibit – The Importance of Global Cooperation – The Incredible Shrinking Gold Supply". International Monetary Fund. Retrieved March 18, 2014. ^ "M2 Money Stock | FRED | St. Louis Fed". Research.stlouisfed.org. Retrieved March 18, 2017. ^ a b c d e f Frum, David (2000). How We Got Here: The '70s. New York, New York: Basic Books. pp. 295–98. ISBN 0-465-04195-7. ^ "Unemployment in the U.S. - Google Public Data Explorer". Google.com. Retrieved March 18, 2017. ^ McMahon, Tim (April 3, 2013). "Historical Inflation Rate". p. 3. ^ Lehrman, Lewis. "The Nixon Shock Heard 'Round the World". Wall Street Journal. Retrieved March 26, 2013. ^ Kollen Ghizoni, Sandra. "Nixon Ends Convertibility of U.S. Dollars to Gold and Announces Wage/Price Controls". Federal Reserve History. ^ Nixon, Richard. "Address to the Nation Outlining a New Economic Policy: "The Challenge of Peace"". The American Presidency Project. Retrieved March 26, 2013. ^ Yergin, Daniel; Stanislaw, Joseph (2002). The Commanding Heights: The Battle between Government and the Marketplace that Is Remaking the Modern World. New York: Simon & Schuster. ISBN 0684829754. cited in Yergin, Daniel; Stanislaw, Joseph (2003). "Nixon, Price Controls, and the Gold Standard". Commanding Heights. PBS. Retrieved November 23, 2012. ^ Krugman, Paul. The Gold Bug Variations; 22 November 1996. This page was last edited on 8 April 2019, at 21:52 (UTC).